Merry has successfully become a child. Successfully in that she is alive and she is a child. 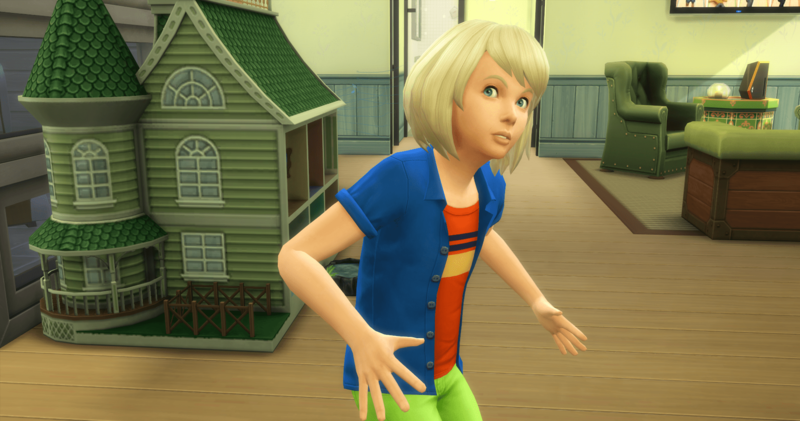 She gained the Mean trait and picked up the Rambunctious Scamp. 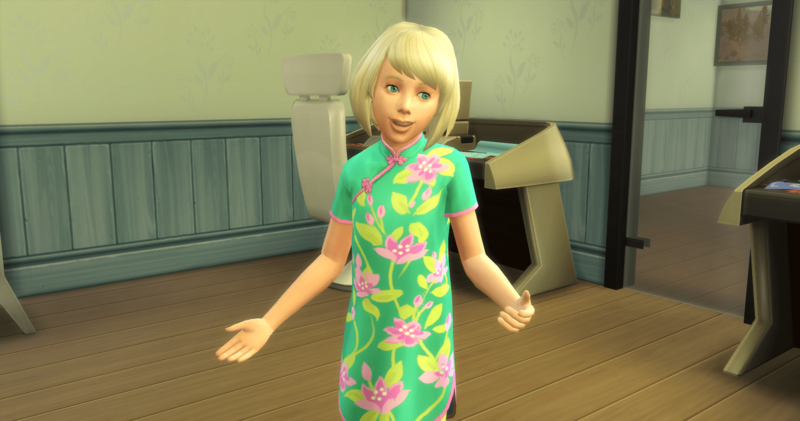 She earned the Top-Notch Toddler trait because of her good work during her toddler time. 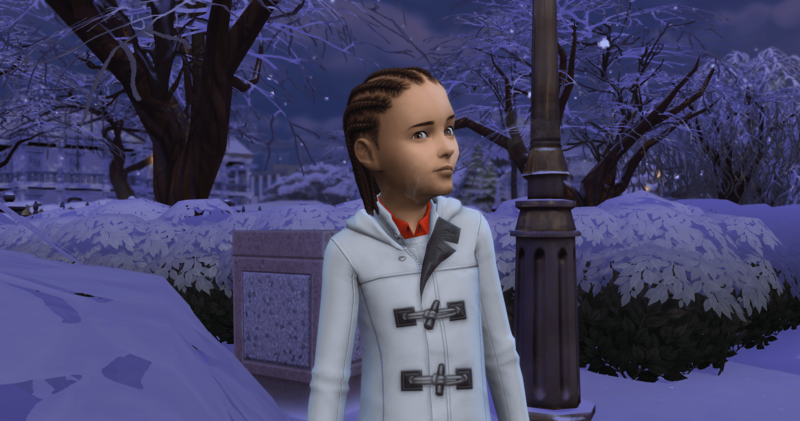 But seriously – my wonder child, the future matriarch of the 100 baby challenge rolled the Mean trait. Oh Joy. She can also begin using the potions that her parents have been collecting for her. 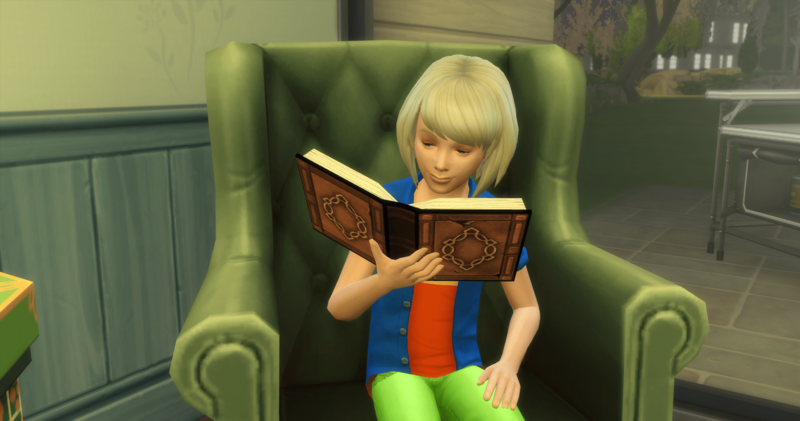 She will be working on the mental aspiration and skill first so she can get that A in school. 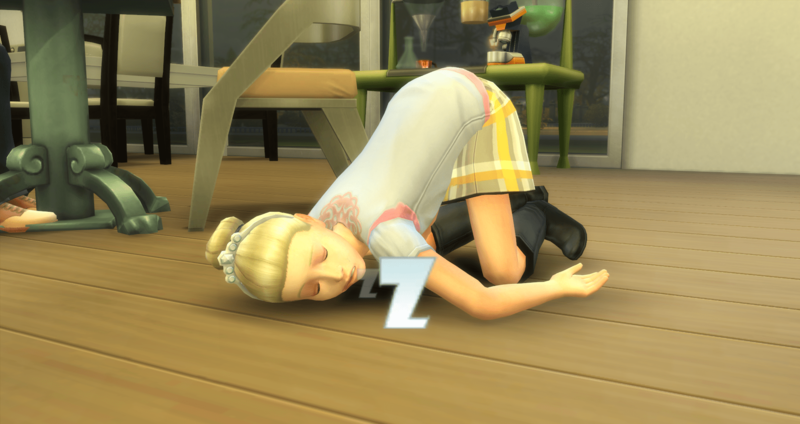 First things first, a makeover and some sleep. 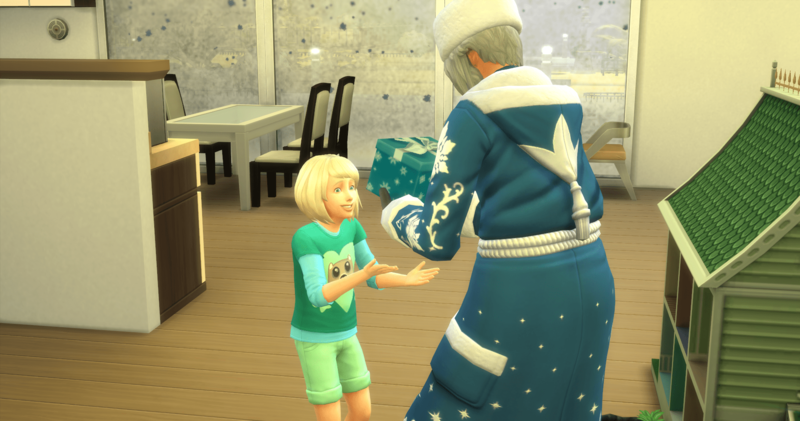 With Merry now of the right age to use potions (I just realized she shouldn’t have gone to bed), I am spending Castor and Portia’s points to load up Merry with moodlet solvers so she can get started. Castor has 10,975 points to spend (21 potions) and Portia has 12,500 points to spend (25 potions). 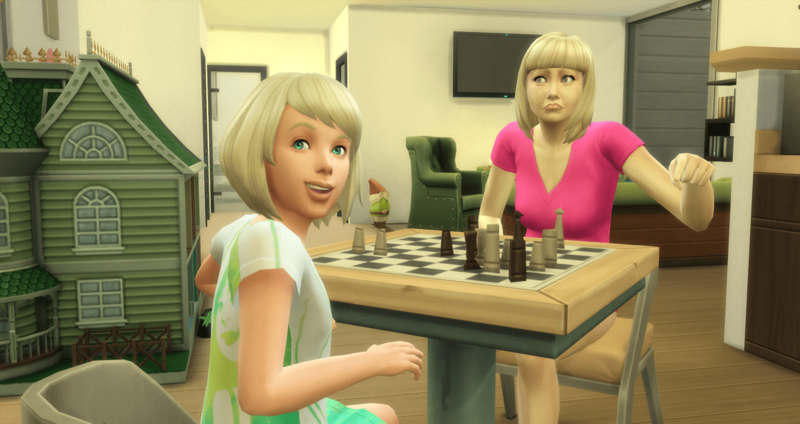 I get Merry up from the bed she will never sleep in again and send her to play three games of chess with Portia. Joyful Mean-Spiritedness: Merry delights in being nasty to others. 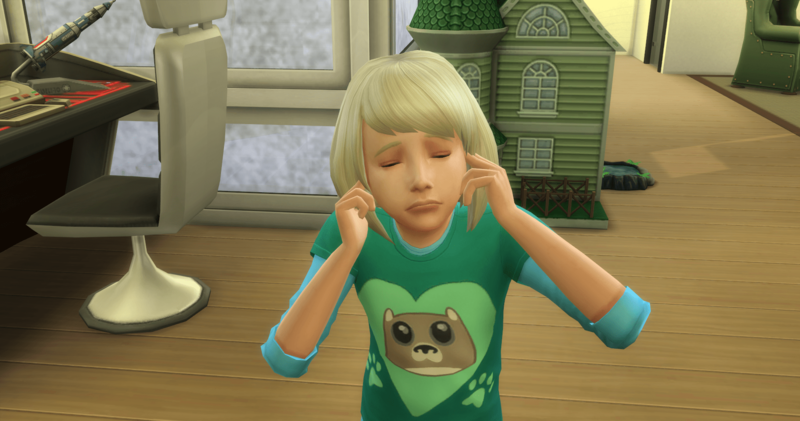 Castor was johnny-on-the-spot and called her out for her meanness quickly. It didn’t help her mood that Portia was cheating though. Merry drinks her first potion and gets started leveling skills. The potion really must not taste good. 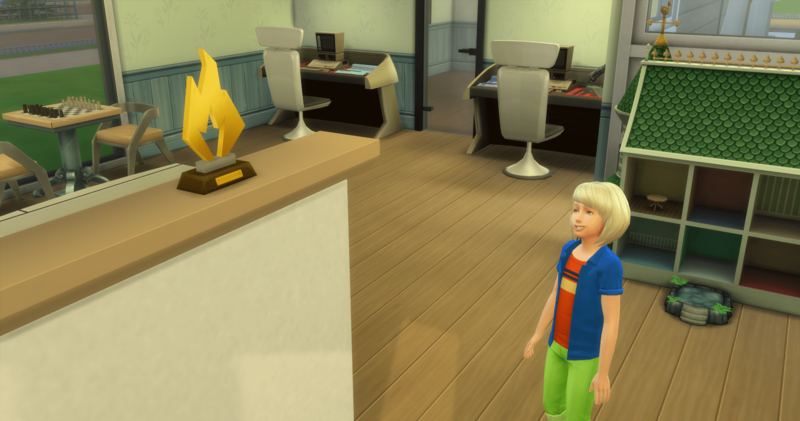 She creates a club in order to utilize “some” of the perks ( these are all bought while she is a child). 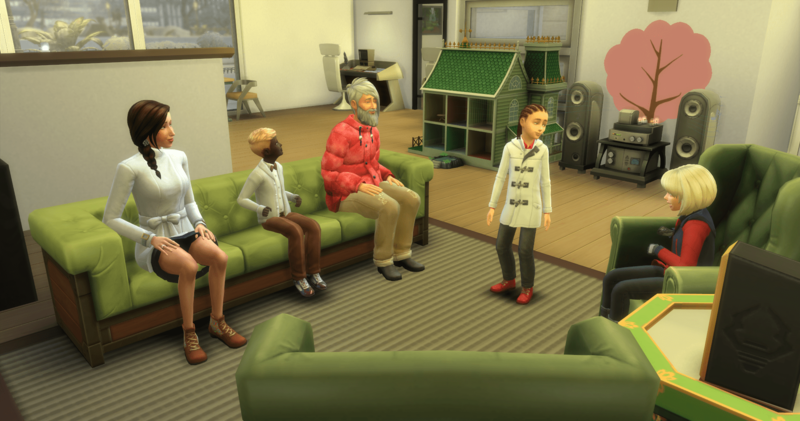 She will have a gathering running constantly for the rest of the challenge. 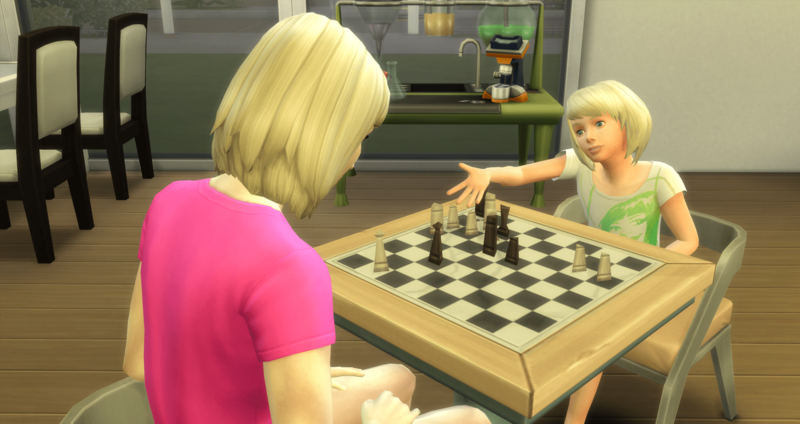 In addition to working on Merry’s skills, Portia is still trying to complete Super Parent, which means she needs to help Merry with her school work. That works out to Merry’s benefit. This is what happens when you don’t dress for the weather when you go to school. I am hoping Merry’s intelligence increases with her mental skill. 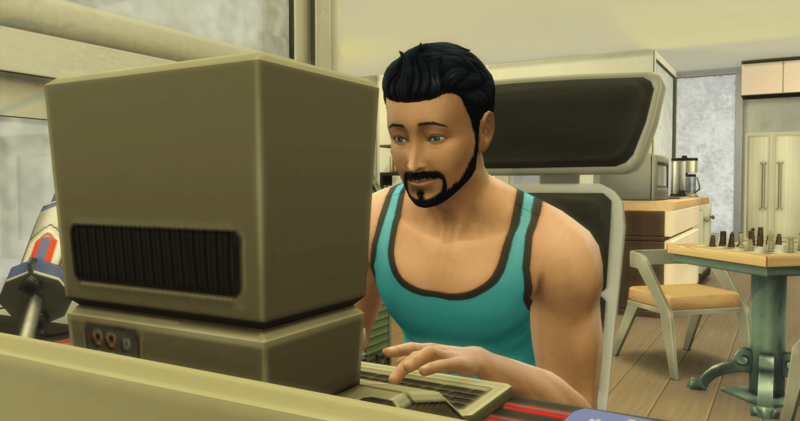 Castor finally completes Computer Whiz – and switches to Nerd Brain. He is able to add three more potions to Merry’s stash. 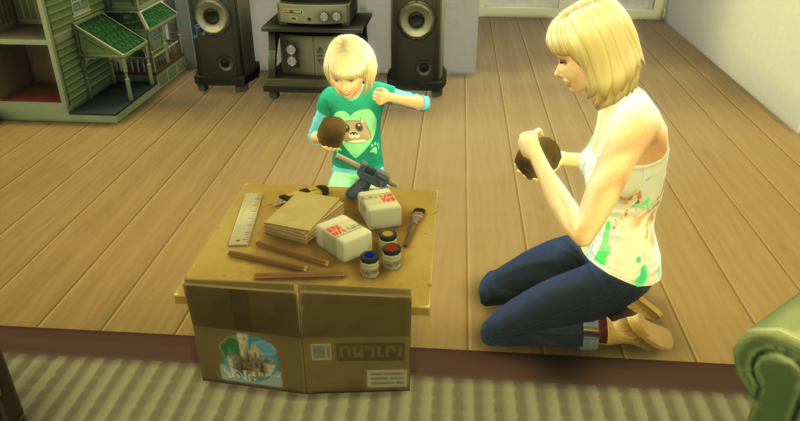 A few hours later, Portia completes Painter Extraordinaire and switches back to Super Parent, adding 5 more potions to Merry’s backpack. 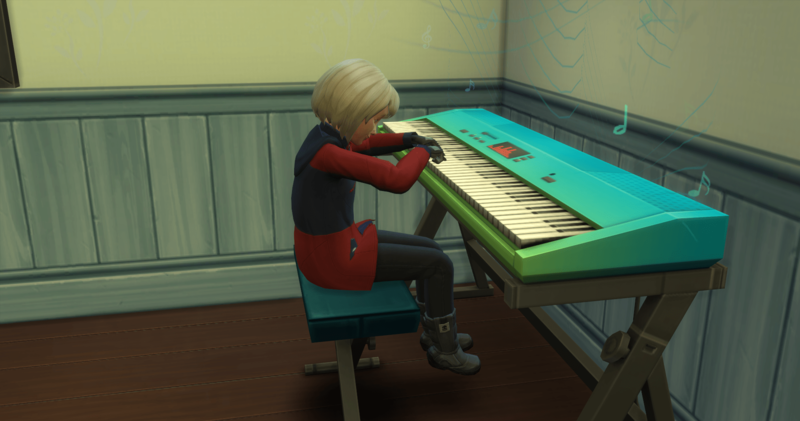 While Merry waits for the next school day, and hopefully her A, she works on creativity. Feeling a little adventurous, she drinks one of the emotion potions she made. It makes her warm and fuzzy and brings on the good vibes! You never know what emotion you are going to get so drinking these really are a crap shoot. 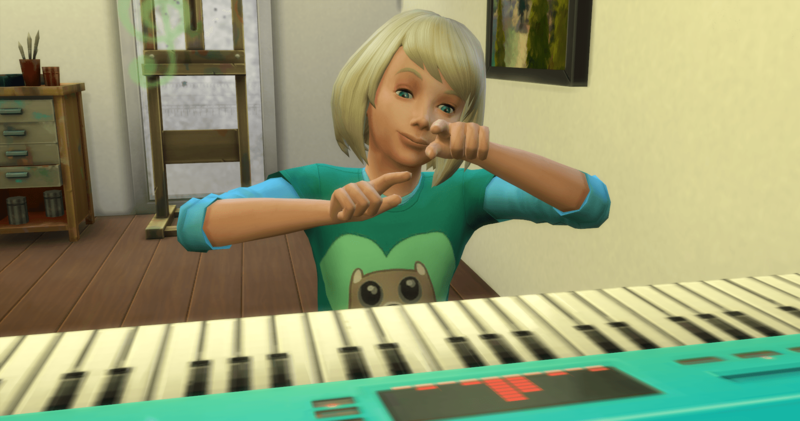 Merry completes Artistic Prodigy while (still) waiting on her A – she had a holiday due to Winterfest and didn’t have school. Since she is (still) waiting on her next school day, she moves on to building the motor skill. Merry needs to go play on the pirate ship but there is a blizzard outside. I guess she will be waiting to do that for a little while longer. 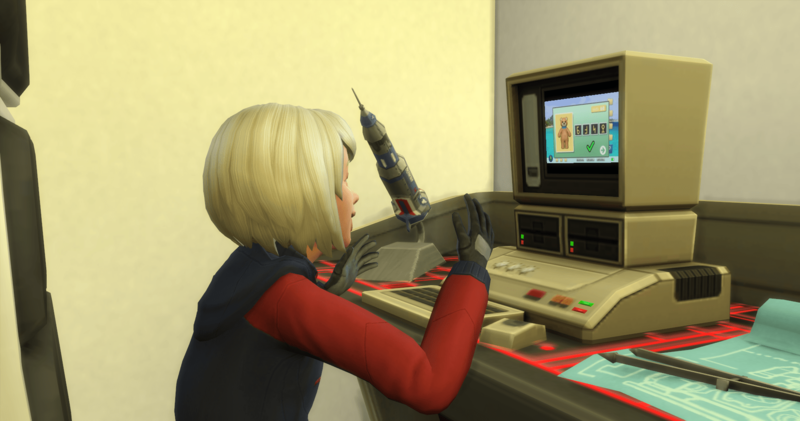 Switching to social doesn’t help as she needs to meet five new sims. So she is going to level skills until the weather improves. 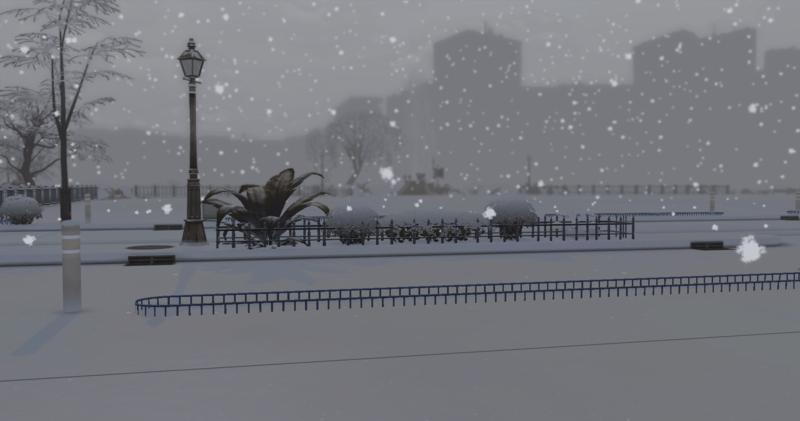 Everyone completed the Winterfest traditions so they took down the tree and got back to business. 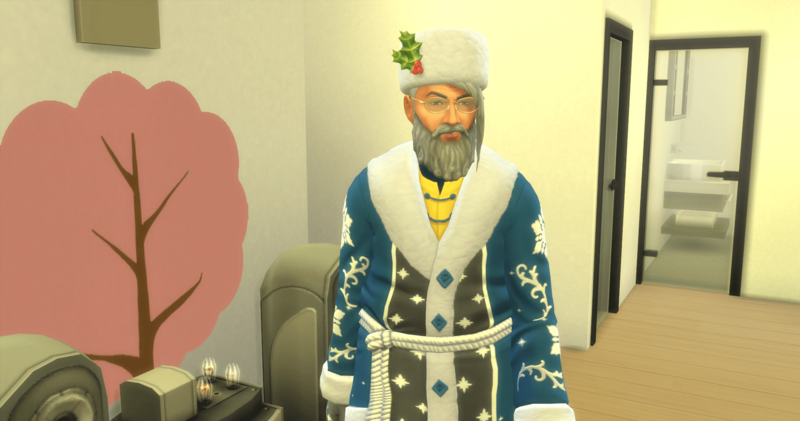 Father Winter still showed up and came through the front door (no tree, no fireplace). 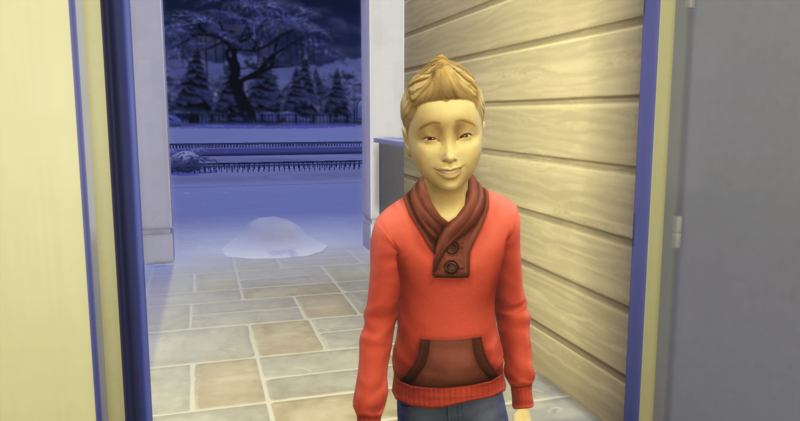 I was under the impression he would only come if there was a fireplace in the house. Now I know. I had been squeezing a fireplace in where there was no room just so he would come for no reason. Well, learned something new, I did. Merry was surprised to see him (I wasn’t the only one) and to find out that he brought her a gift (she wasn’t mean enough to make the naughty list). He brought her a Wisp trading card (that came in handy later). Merry still has no interest in learning about manners but she pays attention to what Castor says about conflict resolution. 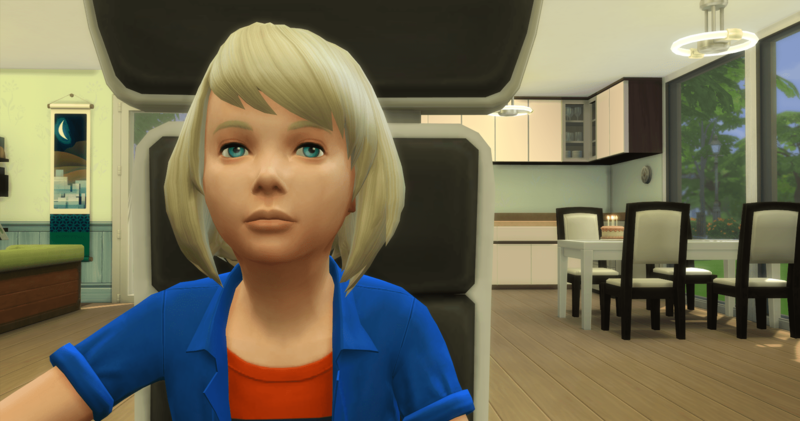 It is like she knew she was going to be mean when she got older. 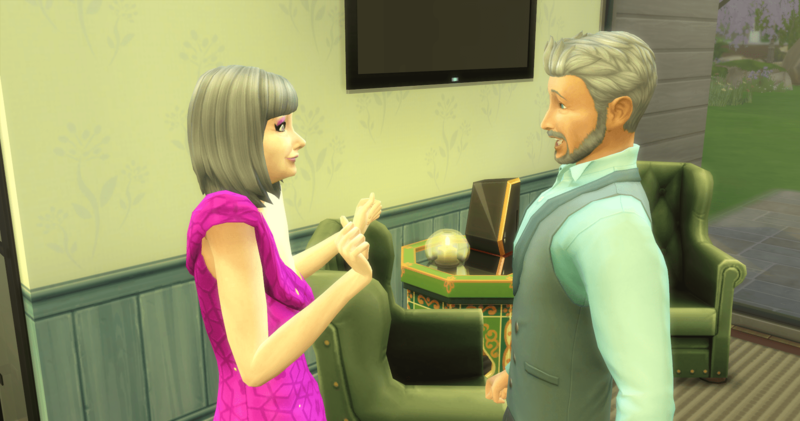 Manners are Dumb: That conversation Merry had about saying please and thank you was boring. Everyone knows to get what you want, you have to cry and pout. Knowing When to Say Sorry: Rest assured, Merry will know when to apologize, and not be afraid to do it! 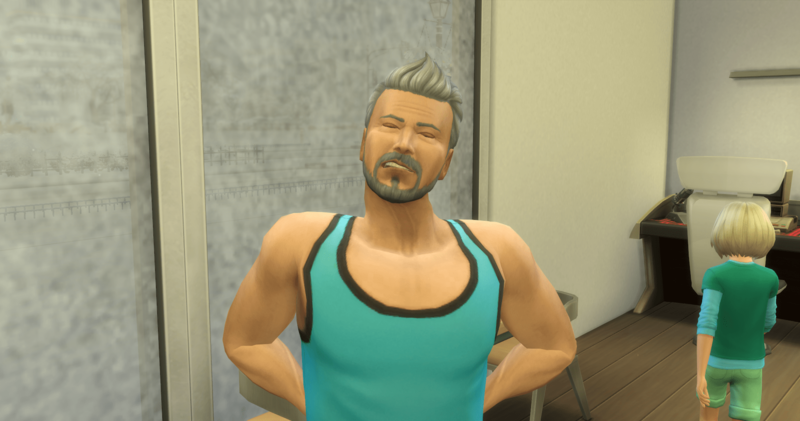 Castor has reached old age and is feeling every ache and pain. No cakes for these guys, they get to feel their age, just like the rest of us. The weather clears up enough for Merry to go outside to the playground. She doesn’t dress appropriately so I really do have my doubts as to her qualifications to be wonder child, but maybe she will grow into the role. I hope. If she survives. 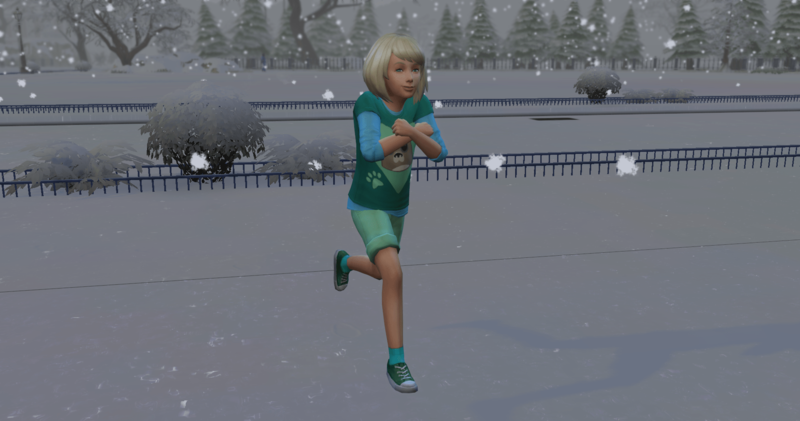 Merry puts on cold-weather clothing finally (after I tell her) and heads over to the monkey bars. She needs to meet some new kids, but first things first – three times across the bars, check. 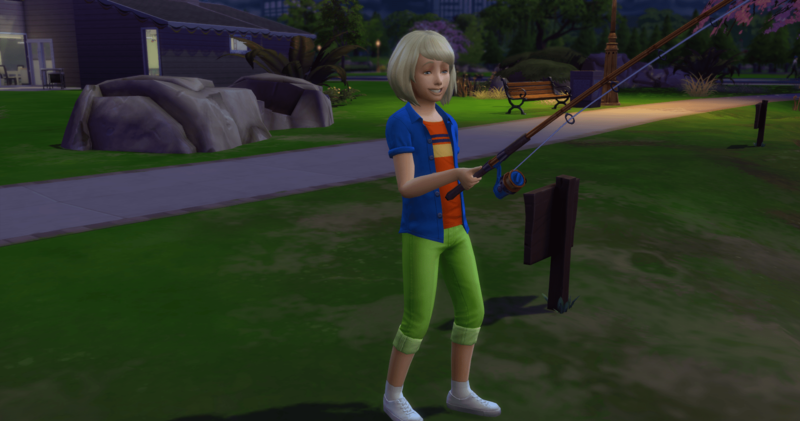 After finishing up on the monkey bars, Merry meet five new sims and then she heads home. She is still alive and not frozen solid, so it has been a good day. Back at home, Merry play Keyboard Commander and tries to get the high score. She plays and plays and plays until she achieves it – and in the process masters the motor skill – which also completes the physical aspiration. Two down, two to go. Go, Merry, Go! She finally goes to school and immediately gets her A which completes the mental aspiration, so it is time to move to her last aspiration – social. 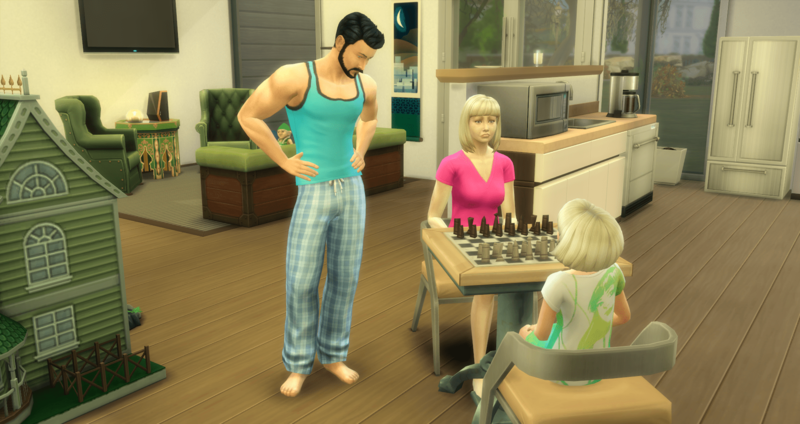 She choses Daichi out of the pool of sims she knows and invites him over. She makes him her new BFF and it doesn’t take long. If this were any other challenge, he would be potential spouse material. But, alas, it isn’t, so he isn’t. 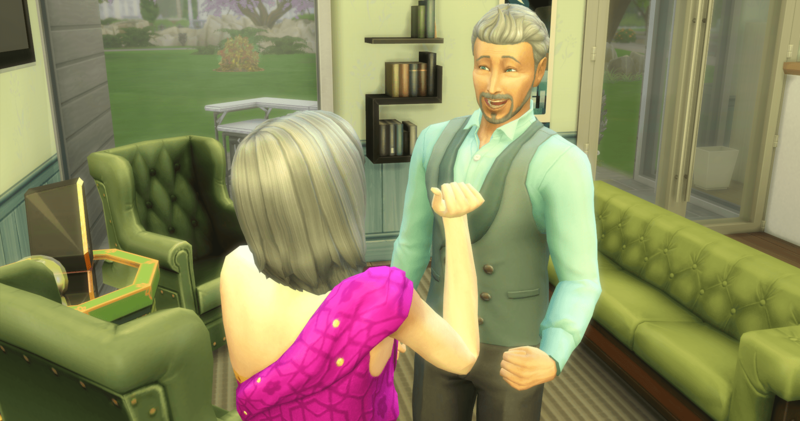 Then she invites over the other sims she met previously and begins building her relationships with them. 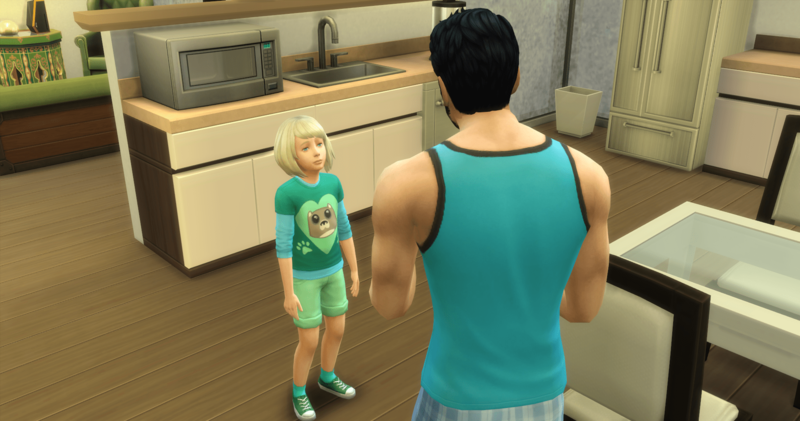 Only one of her contacts did not show up so she is one child short at the end of this social session and since it is 1:30 AM, she will be waiting until morning to finish up. And then I remember… Naoki is added to the family club and a gathering is started… 🙂 2:30 AM and there he is, and an hour later, Merry has completed her last aspiration. 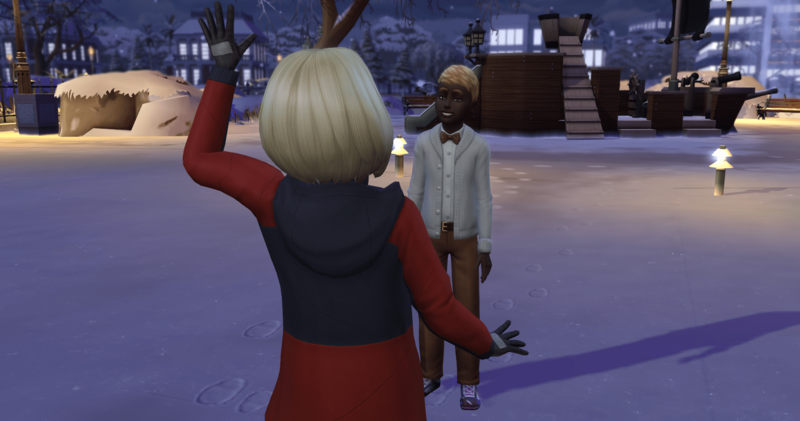 Naoki is promptly removed from the club and Merry says goodbye. Go home. 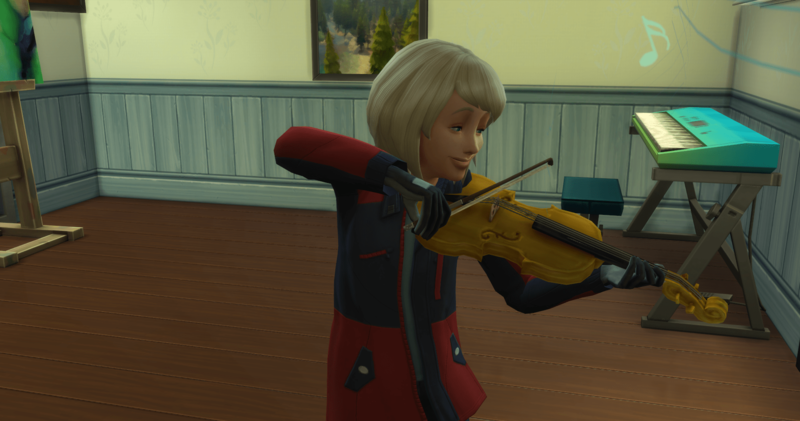 Merry has completed her childhood aspirations, now she will be working on building the adult skills that are available to her. 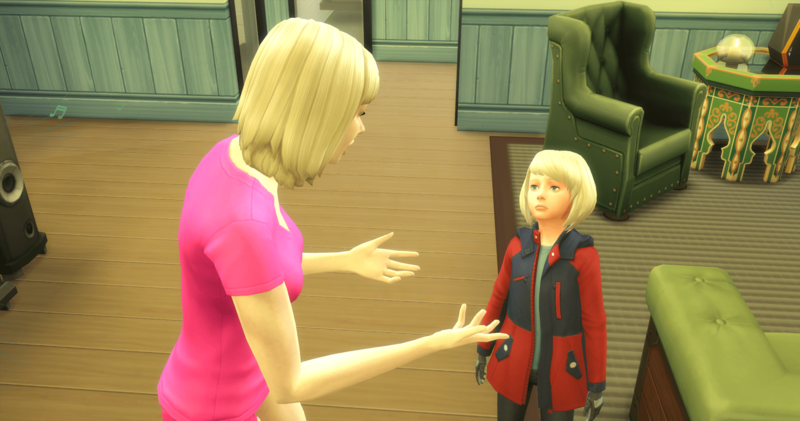 And, despite all of her objections, Merry’s manners are in range to earn the Good Manners trait. She has objected to every attempt to teach her manners. But Portia and Castor have persevered and it has paid off. Merry learned about saying please and thank you and feels very inspired now. The world would be a better place if everyone used those words more often. 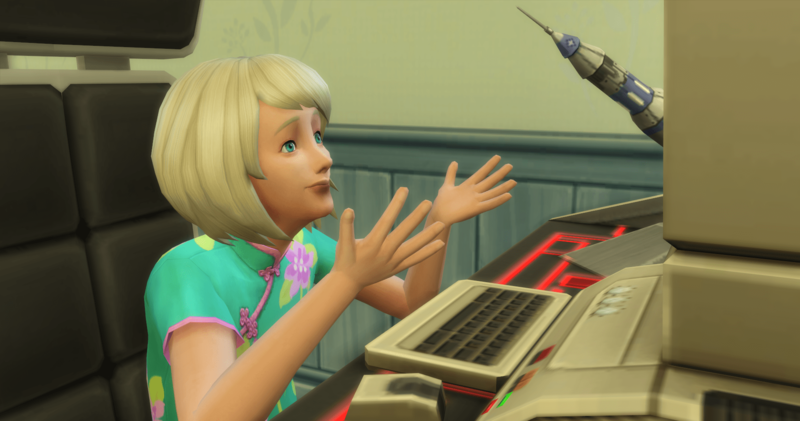 I didn’t want Merry trashing her relationship with Castor or Portia so she started leveling mischief by trolling the forums. Instead she trashed her Empathy character value. She will either get the Insensitive trait or she will spend a lot of time volunteering as a teen to move that back to Compassionate. We will have to see what kind of time she has to spare. After all, a trait is a trait – the points are the same whether they are positive traits or negative traits. The only place it matters is in the next challenge and she already has the MEAN trait. Might as well be INSENSITIVE as well. 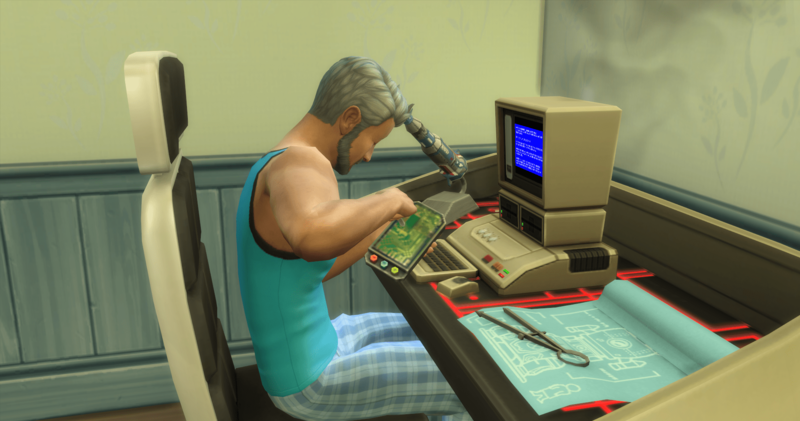 Castor’s job was to repair whatever Merry broke. She would rotate to the next thing and he would come in behind her and make the repairs. 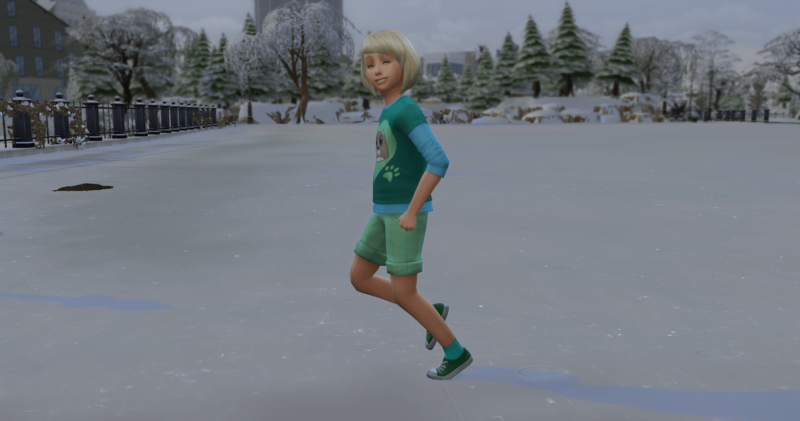 I remembered that scouting also offered a trait – a trait that made learning skills 25% faster, and it stacked with the other skill increases – so, Merry joined the scouts in order to earn the scouting aptitude trait. While she was working on two of the badges, one for socializing and one for making someone laugh, I didn’t notice she was hysterical until she finished. 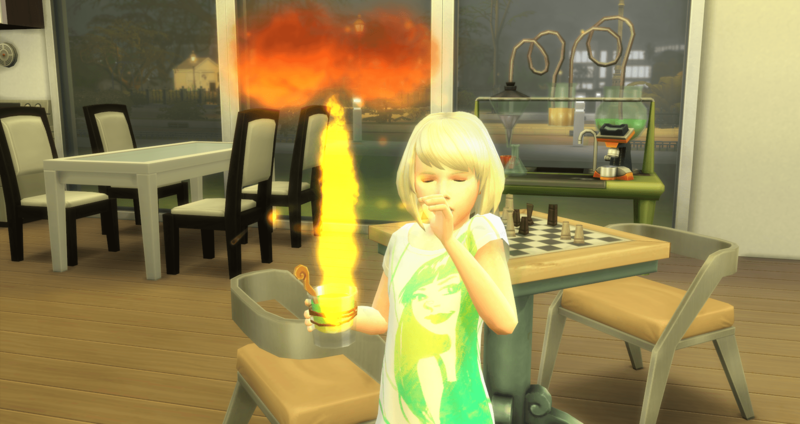 Thankfully I was able to get her calmed down before I had to test whether a child sim could die from laughter. That would have sucked. Really sucked. Merry still has the giggles from her hysteria but she is slowly coming down as she works her way through the scouting badges. The goal is to complete them all while she is still a child. Portia has joined Castor in old age – she looks tired – even though I am basically ignoring them – they go to work and do their own thing. 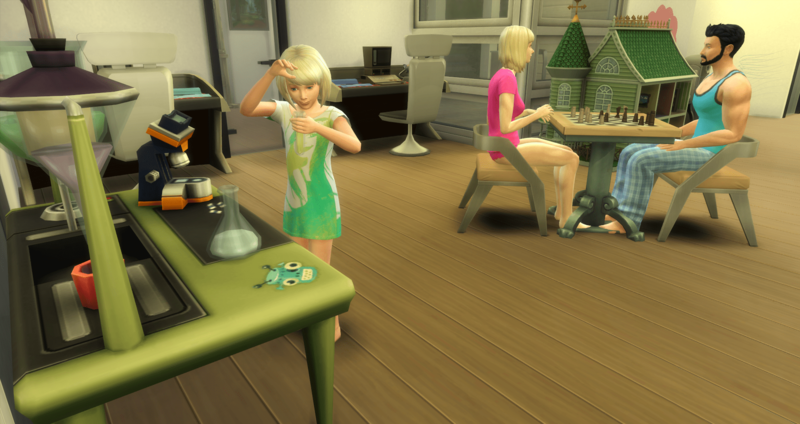 Castor repairs whatever Merry breaks, Portia cleans up the messes. Other than that, they do whatever they want. I am not sure they sleep often. 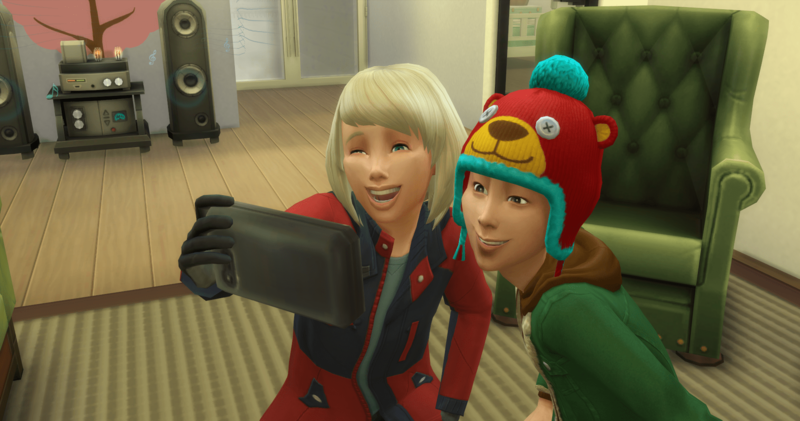 I don’t think I have actually commented on the fact that Castor and Portia are aging. Both of their birthdays happened naturally (no cake). 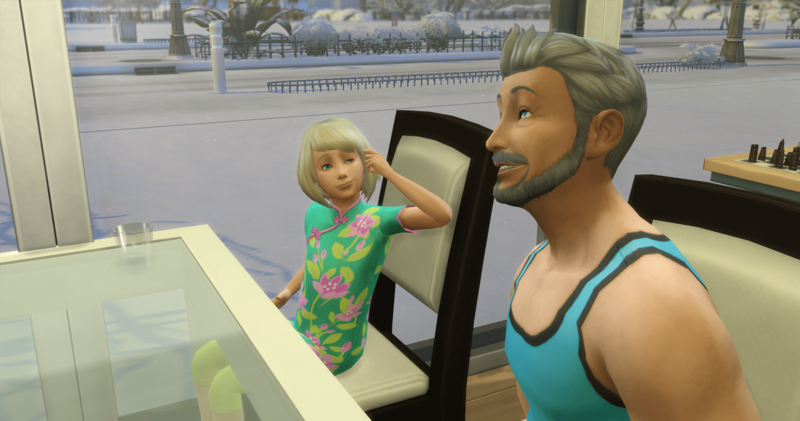 My hope is that with Bodybuilder completed they will both live long enough for Merry to complete the challenge – as of today when Portia aged up, Merry has 5 days of child-hood + 14 days of teen-hood = 19 days until she becomes a young adult. 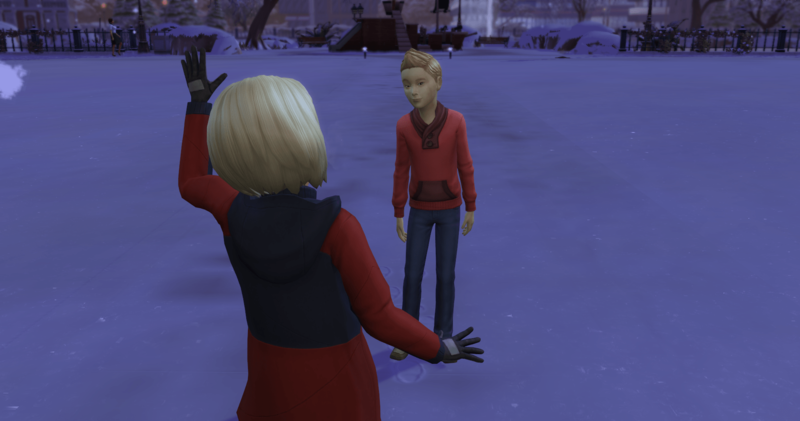 MCCC shows that they “should” live about five days past Merry’s birthday into young adulthood. Fingers crossed. 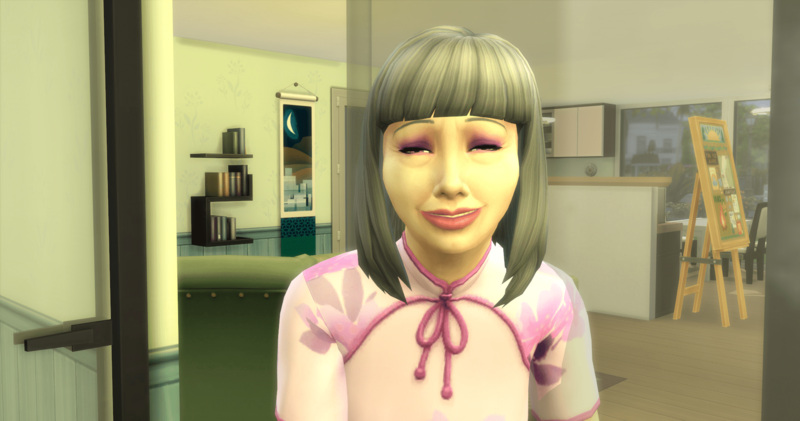 I don’t want her to have any sadness, even though she could drink the moodlet potion to eliminate it. I would rather they hang around and take care of things in the background, make money, etc. 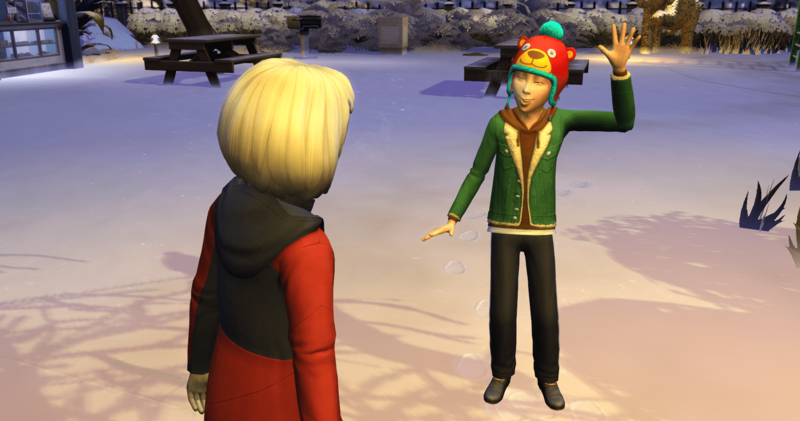 Merry collects the last of the badges and becomes a Llamacorn Scout – and earns the Scouting Aptitude trait. Now she can get back to skill building and the countdown to her birthday. 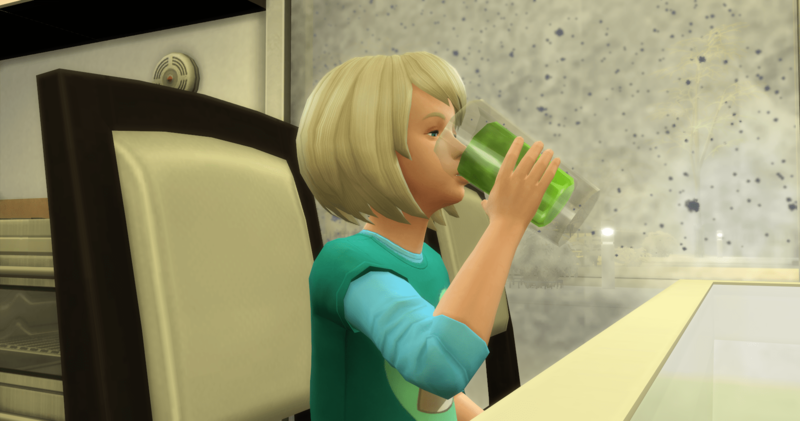 Merry is getting tired of her liquid diet. 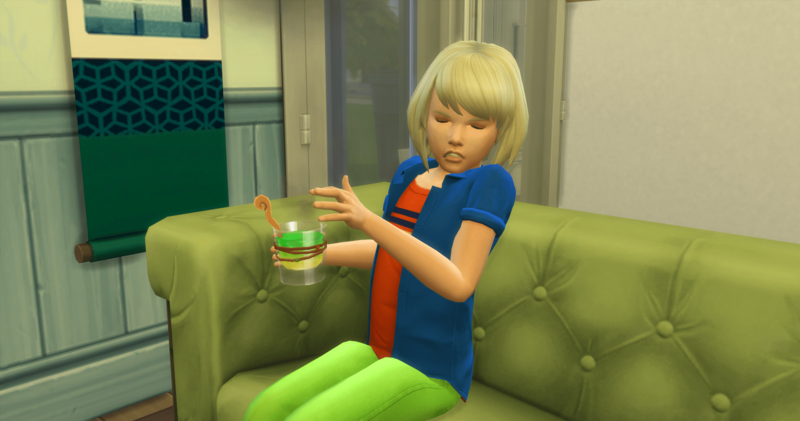 She tried to put the moodlet solver in the fridge and swap it for a bowl of peas, but I caught her and made her drink it. 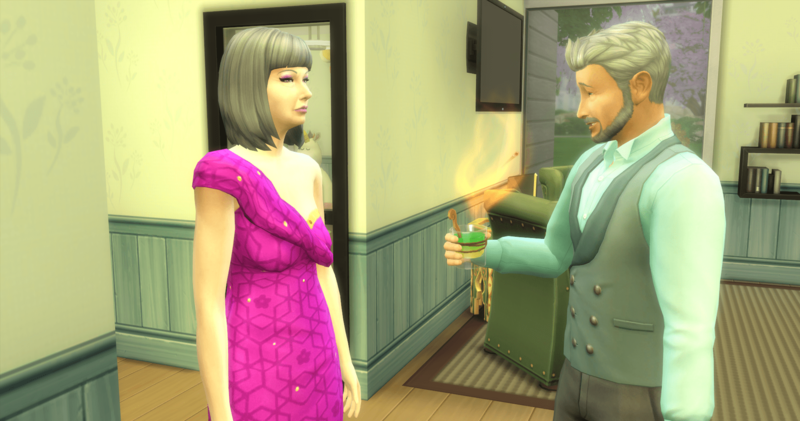 I had to get the potion out of the fridge and cancel the peas from her queue. 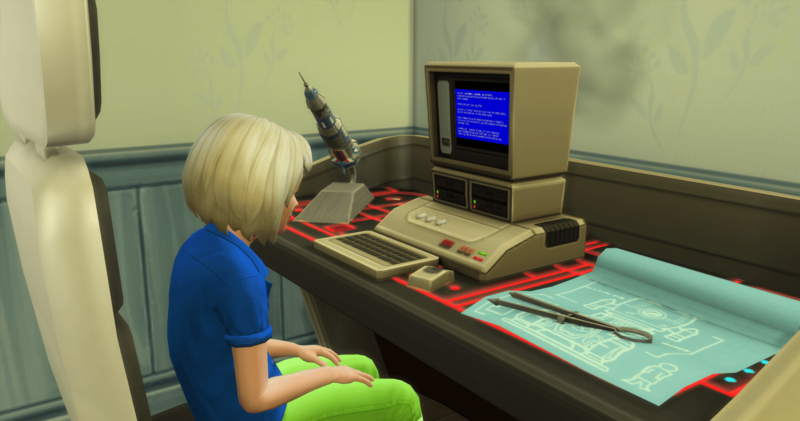 She has even taken to short-circuiting the computers to try to get a break, but that doesn’t work when you have two. She just thinks this life is bad – wait until she has to start popping out lots of babies. 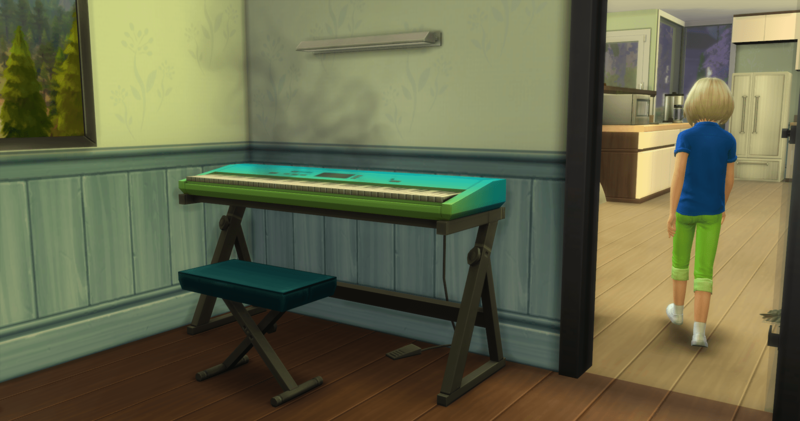 She just fried the piano – I didn’t even know that was possible. 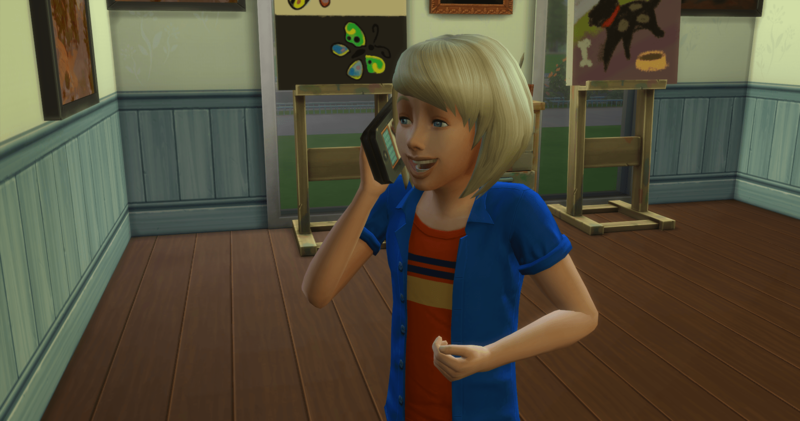 Merry doesn’t have time to spend going to school and she has used all of her vacation days, so she calls in and “plays hooky”. Successfully. This is an option that comes with a high level of Mischief. That should be all of the school days for now. This was for Friday and she will have her birthday on Sunday. I think she gets more vacation days when she starts high school. 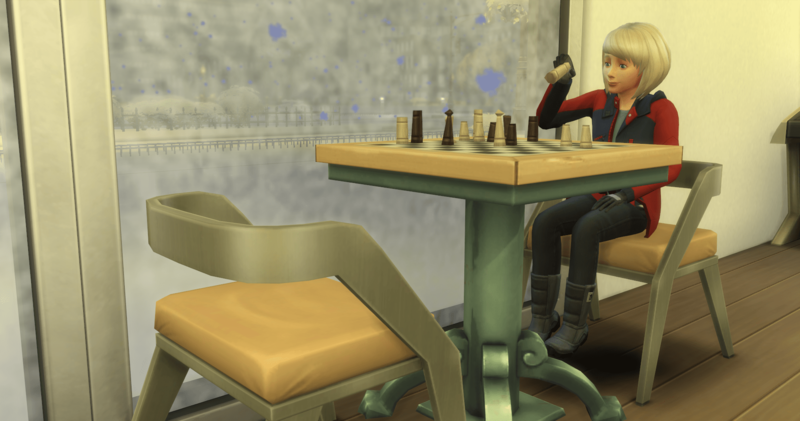 She will need them once she has her A.
Castor and Portia enjoy what is probably their last Love Day and Castor even gets to drink one of Merry’s moodlet solvers so that he is feeling mighty fine. It is Merry’s birthday but we are not going to have a party. She will get a birthday cake but no party. Nope, nada, nothing. Not even trying for gold parties any more. 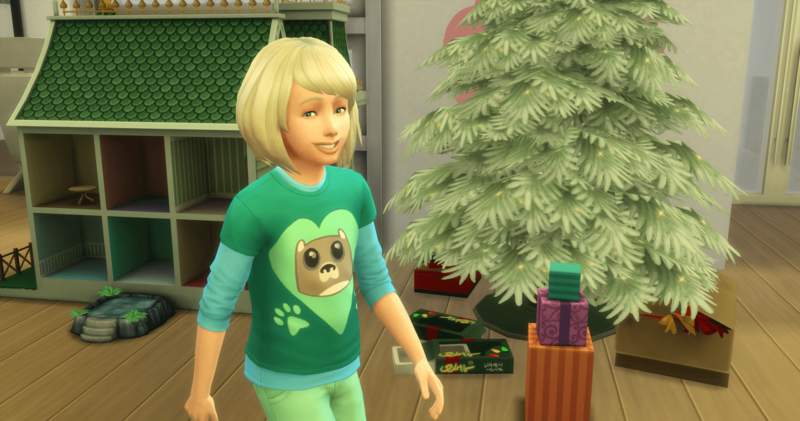 Portia and Castor cash in their aspiration points and give Merry more moodlet solvers as a birthday present (11 from Portia and 9 from Castor).